"Taylor Swift is going for a major glam look. By pairing bright cherry red lipstick with gloss on top, and black winged liner, she really completes a polished look," said makeup artist Rachel Goodwin, who works with January Jones, Rose Byrne and Lea Michele among others. 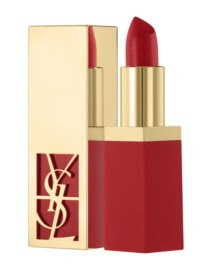 YSL Rouge Pur Shine, $30; at yslbeautyus.com.